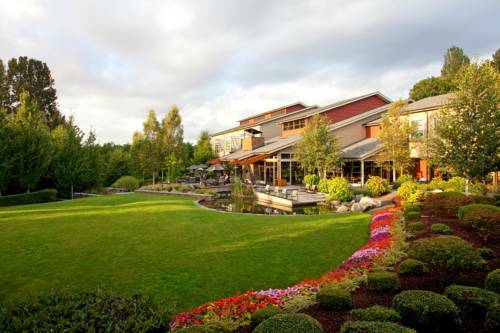 Cedarbrook Lodge located near Seattle Washington offers a quiet secluded environment ideal for a wide variety of social or business gatherings. The Cedarbrook team proudly creates personalized experiences that guests will long remember. Whether you come for a business meeting - company retreat - or wedding celebration - or whether your personal travel is leisure or business - the unexpected comfortable surroundings and service will encourage you to return soon and often. The lodge features 104 guest rooms and suites-18000 square feet of indoor meeting space-5500 square feet of outdoor event space-one restaurant-one lounge-fitness center-in a 100 percent non-smoking environment. Within a five-minute drive from Sea-Tac International Airport. Copperleaf Restaurant: Copperleaf Restaurant is an ideal place to savor lunch and dinner. Floor to ceiling working windows encourage guests to survey Cedarbrook*s 18 acres of natural surroundings while dining on fresh farm-to-table regional cuisine. Copperleaf Bar: Convenient location at which to gather-mix-mingle and enjoy specialty hand-crafted cocktails and micro-brews. Community table. Room Service: Limited menu. 3.50 USD delivery charge and 18 percent gratuity assessed on all orders. Tamarack Hall: Picturesque and comfortable venue to enjoy daily complimentary Northwest continental breakfast. The Cedars: Divisible into Cedar I, Cedar II, and Cedar III. Also combinations offer Cedar I & II and Cedar II & III. Conveniently located near SeaTac International Airport - Cedarbrook Lodge is a mere five-minute drive at 18525 36th Avenue South- SeaTac- Washington 98188.